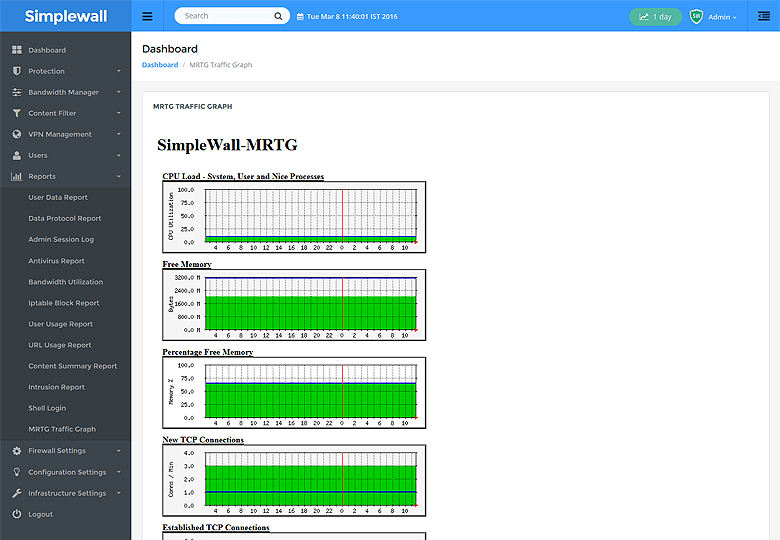 Simplewall delivers robust firewall security, rich content filtering rules engine, bandwidth management and a simple way to monitor and stay on top. 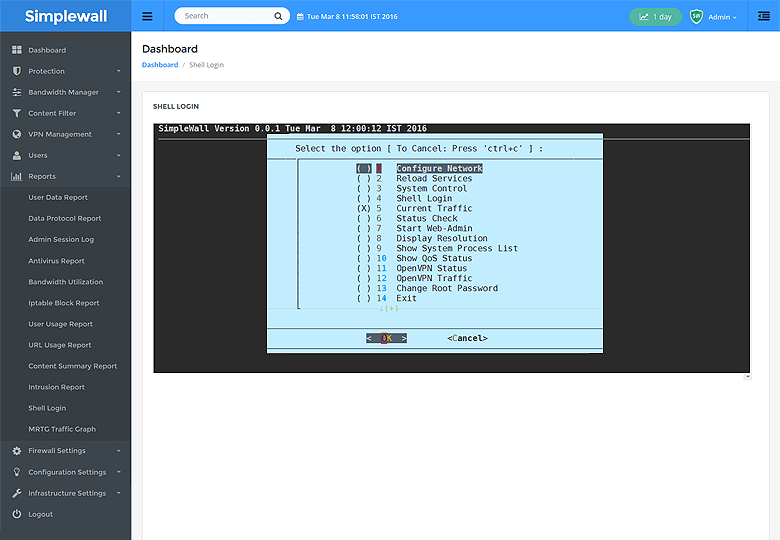 Simplewall is the easiest to install software-only UTM with support for desktops & network appliances. Fully tested in virtual environments like KVM, VMWare, OpenStack etc. 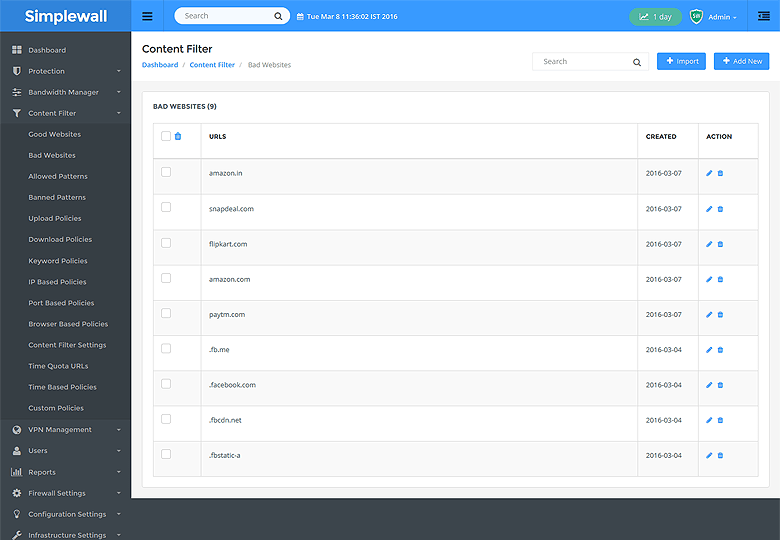 Simplewall delivers the most comprehensive and easy to use content filtering functionality and rules to create a wide range of rules and policies for your network. 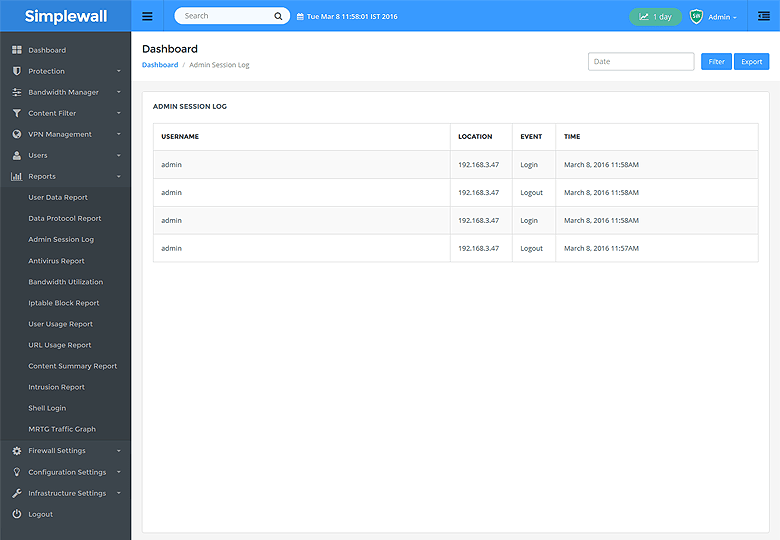 Simplewall comes pre-packaged with all widely used networking features including port map, IP alias, DHCP and DNS server. 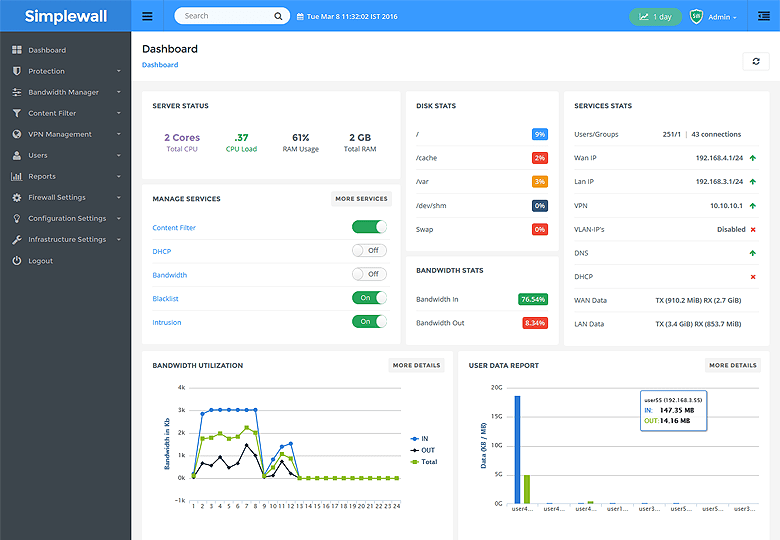 Simplewall makes understanding your network easy with simple dashboards, reports and alerts that tell you what is going on in your network. 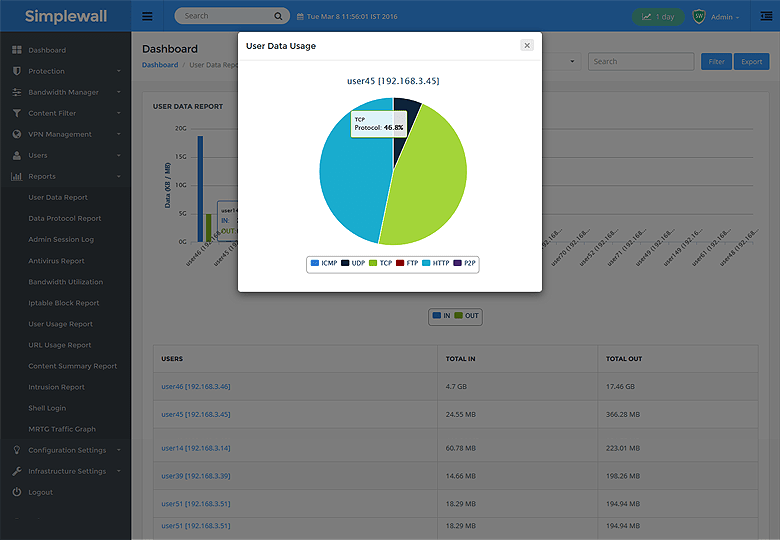 Simplewall presents a never-seen-before user interface that provides user/group wise management of content, bandwidth and protection policies. You can support your company's remote workers with full access and capabilities with an integrated OpenVPN module. It just works, and without much overhead. 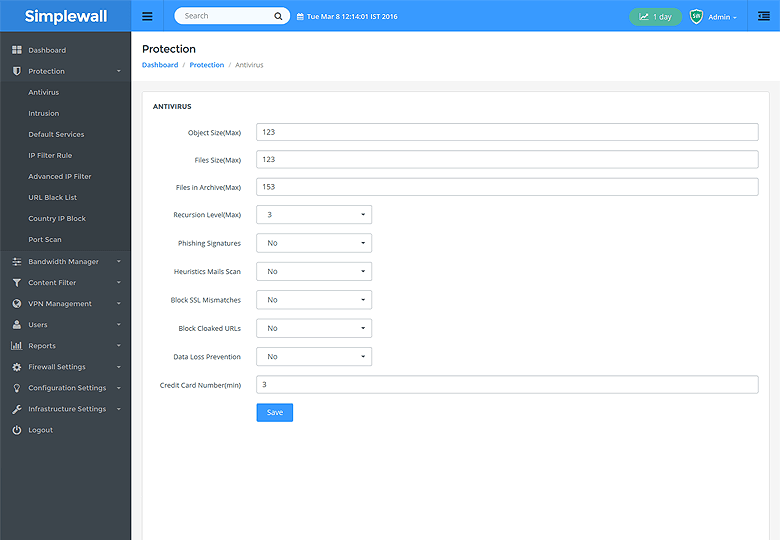 Simplewall comes with IPS integrated with up-to-date signatures as well as configurable gateway anti-virus to protect your network comprehensively. With Simplewall, you can allocate your bandwidth to ensure the most optimal utilization based on the requirements of the different groups of users at your company. 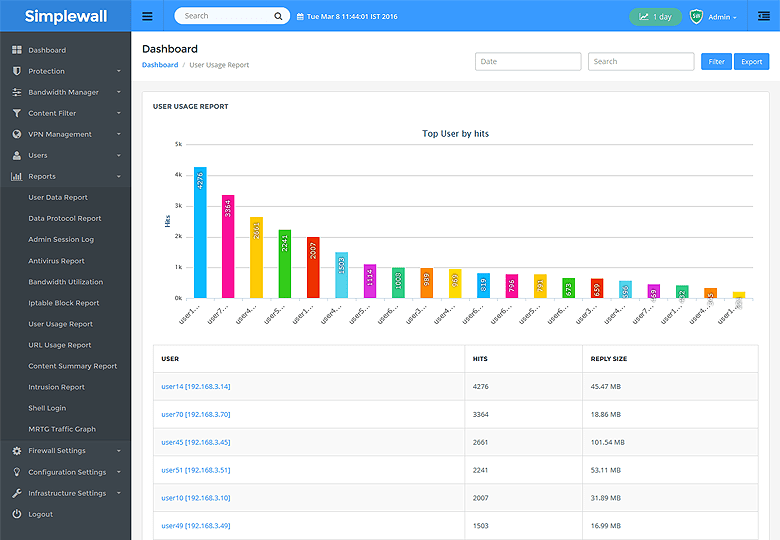 Simplewall comes pre-packaged with all the standard internet community driven URL blocklists as well as country-wise block lists of abused IP addresses. Simplewall helps you keep track of all the key aspects of your network including alerts on a simple and easy to understand Dashboard with everything you need to know. With Simplewall, you get comprehensive intrusion protection, virus protection, spam prevention and a lot more bundled in, so you get the peace of mind you need. Simplewall makes it dead easy for you to manage the content policies on your network and set it by users, group, time slots and a lot more. Make the most of your bandwidth by creating rules and allocating bandwidth as per your organizations need and monitor its performance. Simplewall comes built-in with gateway anti virus that keep you protected with the global standard anti virus database. Quick view of network usage by users connected across your organization. Stay on top of who is accessing and controlling your company’s Simplewall with a quick and easy session log. Get insight into hourly bandwidth utilization across your network and see it displayed in an easy-to-understand graph. Go deep and explore content that is being blocked, top users who are accessing blocked content and a lot more. Stay on top of any intrusion attempts by reviewing a full set of alerts as they happen. Take any corrective measures quickly. Simplewall comes with a fully integrated standardized block list for URLs, IPs and a lot more. Simplewall comes with a shell login utility for shell command line access and configuration. Keep track of the traffic load on your network and the spikes and glitches at a glance. Simplewall is the most comprehensive firewall, content filter and UTM for small businesses. See our full list of features here. You can also compare Simplewall with other products here. See all our customer testimonials here and share your feedback too.